A: The remove item button is located at the right hand side of the "ITEM TOTAL" in the shopping cart. The button is there, it only has the same color as the background, hence the reason why you can't see it. If you hoover the area located at the right hand side of the Item Total in the shopping cart, then you will see that the arrow of your mouse will change in a hand to select something. At that moment you only need to click to push the invisible button where a small window will pop up with the question if you want to remove this item. At the moment you click OK the item will be removed from your shopping cart. 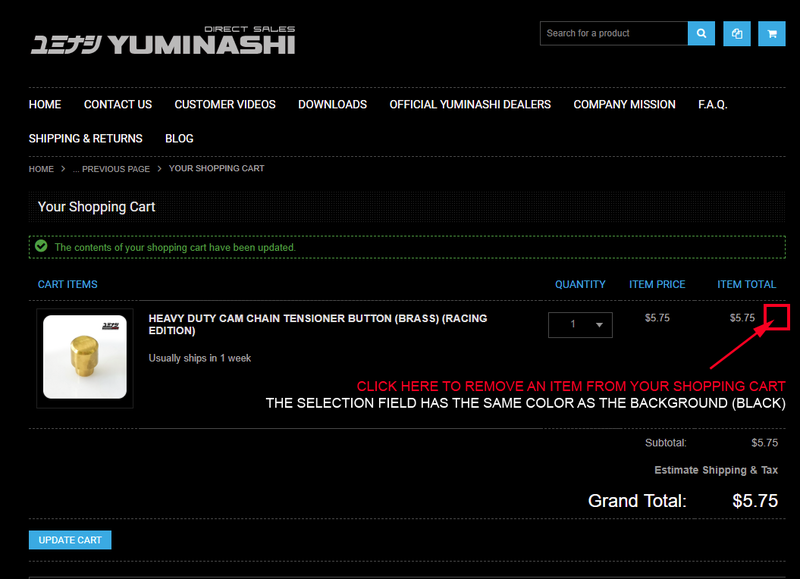 A: First you need to be logged in to the Yuminashi Direct Sales store and click on the Rewards Tab. In the Rewards Section, once you have enough points to spent, the Redeem button will be visible. Clicking the Redeem button will open a new popup window in which you will be given an discount code that you can apply at checkout. This discount code will be sent to your email as well. A: The word "light" refers to the fact that this piston has been made to use in combination with the stock head and the stock valves. The word "bore up" refers to the fact that the piston from this set is mentioned for a larger as stock size piston, but not larger as would be able to bore your stock cylinder up. A: A Light Bore Piston means that the piston size is to large to bore your stock cylinder up, but that you still can use your full stock cylinderhead. If you are looking for a piston to bore your stock cylinder up in combination with your stock head, then you need to use a Light Bore Up piston. A: A Big Bore Piston is a piston mentioned for a big valve head where the size is larger as the stock size, and where the size is even larger as would be possible to bore your stock cylinder up. A: A Super Bore Piston is a piston where the size is to large for the stock crankcases. If you want to install such a piston, then you need to machine your crankcases first to be able to accept such a piston. A: A Bore Stroke Up piston is a piston mentioned to be used in combination with a longer as stock crankshaft, in combination with a big valve cylinder head. A: A Light Bore Stroke Up piston is a piston mentioned to be used in combination with a longer as stock crankshaft, in combination with the stock cylinderhead like the Honda PCX150 cylinder head as an example.